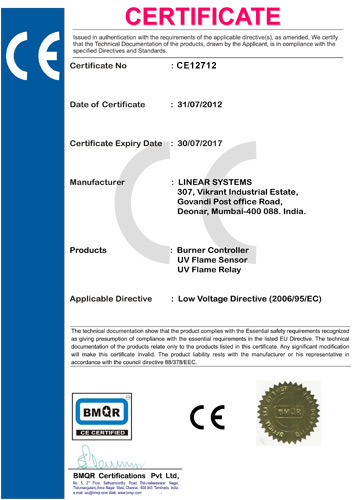 Mother Dairy Food Products Ltd.
We "Linear Systems, Mumbai", are catering to the requirements of various industries since 1986 with our wide range of burner controllers & components for boilers and furnaces. The core competencies of our manufacturing capabilities are quality product and dependable services. A quality conscious enterprise, we have started our operations with an aim to offer innovative and efficient systems to our clients. We Export our products in all over the world. Our range includes burner sequence controllers, UV sensors and amplifiers, flame rod amplifiers, burner controllers, flame sensors and flame amplifiers. We have immense expertise in manufacturing flame monitoring and evaluation systems in the process industry as per international standards. With a support of our world class manufacturing unit and a team of professionals, we accomplish the entire work orders within the scheduled time-frame. Our result oriented and cost-effective services acknowledge us as a reliable OEM source for major boiler & furnace manufacturers. Work as a team with customers and suppliers. Maintain a clean and healthy working environment. Growth coupled with customer's satisfaction. We have a excellent infrastructure facility comprises of various sections and departments. With own cutting edge production line, we are capable to manufacture bulk amount of products. Our profound infrastructure enables us to process the entire consignment orders within the stipulated time schedule. Located in Mumbai, India. For effective quality assurance and control, we have an in-house quality control department. This section is provided with all requisite testing tools. The testing is carried out by qualified quality control professionals. Issued in authentication with the requirements of the applicable directive(s), as amended, We certify that the Technical Documentation of the products, drawn by the Applicant, is in compliance with the specified Directives and Standards. Hindustan Coca Cola Beverage Pvt. Ltd.
Guvt of India Ordnance Factories. Premier SPG & WVG Mills Ltd.
Pepsico India Holding Pvt. Ltd.
Bharuch Enviro & Infrastructure Ltd.
We offer a wide range of burner controllers & components for Boilers and Furnaces. Our range includes UV sensors and amplifiers, burner sequence controllers, burner controllers, flame rod amplifiers, flame amplifiers and flame sensors. We are also offering our services as a OEM manufacturer for various boiler & furnace manufacturers. In addition, we have developed tie-ups with number of boiler, burner and furnace manufacturers for their controller requirement on OEM basis. • Local and remote reset facility. NOTE – WE PROVIDE TWO YEARS OF WARRANTY ON OUR PRODUCTS. Our consistency in premium grade products and customer oriented services enables us to establish our reputation as a trustworthy and reliable supplier among a vast domestic as well as international client base. We have supplied more than 20,000 controllers in global markets. Our products have been installed in countries namely South Africa, Canada, Saudi Arabia, Sudan, Bangaldesh, Nepal, Sri Lanka, etc. Product export to countries like Canada, South Africa etc.